It’s a challenge growing trees in Southern Colorado, but one very patient man has found a way to cultivate black walnut trees, creating a hardwood legacy for the next generation. Lewis Meier, 77, was told by expert growers he wouldn’t be able to grow walnut trees in Penrose, but he wanted to try anyway. It was his plan to pay homage to the nut trees he grew up with in Oklahoma. “I always had a pocket full of pecans when I was growing up near Oklahoma City. This is for the future. I am leaving something for the children, something that I saw as a child,” Meier said. 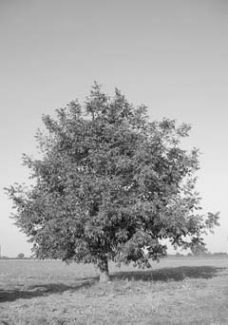 After plenty of reading and study, Meier decided walnut trees could be ideal for the colder climate of Colorado, because he said they “work slow.” The late bloomers wait until about the second or third week of May to unfurl their leaves and blossoms. By then, the danger of heavy frost and ice storms has usually passed. Meier has cultivated a few different varieties of black walnut trees on his five-acre spread ” about 200 in total. He has accomplished the feat by planting walnuts and by using grafting methods. Walnuts are husked, washed and then gradually dried before they are ready to crack open and eat. In the book, “Black Walnut” by Bob Chenowith, Meier discovered that most of the good walnut trees grow where there is limestone deep underground ” similar to the geology in Penrose. The limestone chips that sift up in the soil are like food for the trees. Planted close together, the trees will grow up instead of out ” adding four feet in height each summer. Meier trims a few of the branches higher up the trunk each year so that somewhere down the road when the tree is harvested for its hardwood, it won’t have knots. “It makes for a more appealing veneer all along the length of it. You need one tree to make a great 12- to 15-foot walnut table because wood from another tree will be different,” Meier said. Amazingly, Meier does not experience problems with bugs or drought. He did not lose any of his trees during the 2002 drought. “If they can get a tap root down at least four or five feet, they are good for a while without water,” he said. When a walnut tree does die, he cuts it off and a new one will grow in its place from the hardy root system that remains. Walnut branches and dead trees don’t go to waste on the Meier spread ” they are used by the industrious retired Chrysler welding machine maintenance man to make birdhouses and candle holders or burned for firewood. The trees give Meier “a lot of walnuts,” many of which he sells to Happy Apple Farm. Preparing the walnuts for consumption is another exercise in patience. They have to be put through a machine to remove the husks, washed with water in a machine that is really a cement mixer, then placed in a shed to slow dry before they are ready to crack and eat. “You want them to dry gradual so they don’t crack open like they would in the sun. If they crack open, they can get bugs,” Meier said. One variety of black walnut Meier is especially fond of features plump, sweet meat that is easy to remove from the shell. Meier also dabbles in growing black and red currants, Indian corn, sunflowers, broom corn, pears and peaches, plus ash, oak, cedar and poplar trees. One of his longest surviving crops is a variety of wine grape called “Chancellor,” which has never succumbed to frost or winter kill like other grape varieties he’s tried. He sells the grapes for 60 cents a pound to winemakers. He also sells birdhouses from his home, and encourages interested growers to stop by and see the walnut trees. “These woods are good for 300 to 400 years. My dad lived to be 94, so hopefully I’ll live to be 94, but I’m thinking of the next generation. “You can’t be selfish ” I’m not getting anything out of it. You gotta think of the children when you grow good lumber trees,” Meier said.